You may also want to check out our "Get Smart (1995)" page. 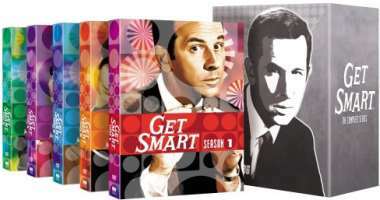 The Get Smart TV show was a comedy series that aired on NBC for its first four seasons and on CBS thereafter. Agent 86 (Maxwell Smart) consistently goofed things up in his fight against the evil forces of KAOS. Luckily, his partner (later becoming his wife), Agent 99, always managed to somehow bail him out of his disasters. Don Adams was a United States Marine during World War II. He got Malaria during the fighting in Guadalcanal. His TV career started when he won the competition on the TV show, "Ted Mack's Amateur Hour". The "Cone of Silence" was a device that was suppossed to guarantee privacy so that agents could tell each other secrets with no chance of being overheard. Of course, it never worked! It appeared in only nine episodes. Barbara Feldon appeared as a contestant on the "$64,000 Question" quiz show and actually won the entire $64,000! That was a huge sum of money in those days! Her question category was "Shakespeare". Bernie Kopell came to the show in the 2nd season as Maxwell Smart's evil rival "Siegfried". You might know Bernie better as "Doctor Bricker" on the show "Love Boat". Robert Karavelas played the role of "Larabee" on the show. In real life, he was Don Adams' cousin. Contrary to popular belief, Agent 99's real name is never revealed. In episode #79, "99 Loses CONTROL", she states that her name is Susan Hilton, but at the end of the episode, she tells Maxwell Smart, "Susan isn't my real name." "KAOS" and "CONTROL" are not acronyms. They don't mean anything. Think of it like this: There would be "chaos" in an evil world. A good world is where evil is "controlled." The Chief's first name on the TV show was "Thaddeus". His cover name was "Harold Clark". He had no agent number like "86" or "99" because he became an agent before they assigned numbers. NBC decided to cancell the show at the end of the fourth season. CBS picked up the show and got a ratings increase (for a short amount of time) by announcing that Agent 99 was going to have a baby (which ended out being twins). The Complete Series on 25 Dvds! Get Smart Again! 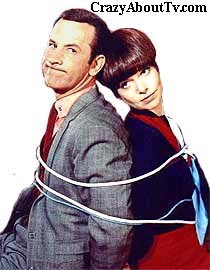 (2/26/1989) - Starring Don Adams, re-united with Barbara Feldon! Thank you for visiting our Get Smart TV show page!